Has anyone used it in a 67/68? Back in 1959 Ford came out with the Select-0-Speed transmission for tractors. My 1967 5000 has one. It’s for windshield wipers lol, I had no idea what it was for until just now either. I would have guessed a transmission piece too! In my experience, even with just "Off", "Low", and "High", it's not much fuss. And on those misty days where the sky can't make up its mind whether to drizzle or not, a gentle tap of the windshield washer pedal will kick the wipers over to clear your view. I like it that way. IMHO, not worth drilling new holes, and figuring out how to mount a Camaro/Firebird motor, linkage, and wire it all up. Not to mention finding a switch that won't look like you've butchered your dash. I chose it for my 65 so I can't help with the 67/68, however it's not like what Grim is describing. It's a lot of money so I'm not sure I would do it again but for the Pacific Northwest it's great to have the flexibility and I wanted something all inclusive. The kit comes with everything you need and is very easy to install. You don't have to figure out how to mount anything, there is a wiper motor spacer that puts it in the right place using existing holes and there is a switch included that allows you to use the stock setup there as well. All you have to do is add power and ground which were already routed to the old setup so you use those. In hindsight I could've looked for all the different setups that are available but this was nice and has intermittent. All you have to replace is the switch and it works. It's a little goofy having to bump it one way or the other to speed up or slow down, but it's better on a drizzly day than having to keep hitting the pedal. That said NPD shows being out of them and the manufacturer's web site (musclecarswitch.com) is expired so they may not be available anymore. If you can find one though they do work and you don't have to deal with any extra wiring or replacing your wiper motor or anything. Thanks for the replies all ... if you google the NPD part number, it is still available from a couple of sources. Haven't decided what I'm going to do - but I like modern things wrapped in classic skin. For 67+ why not use a F100 intermittent switch? Pretty much plug-n-play. The problem with the 67/68 is that they didn't use a normal wiper switch, they made it a three position slider on the instrument cluster. It looks cool, but you've either got to reach around or through the steering wheel to turn the wipers on. And of course it's completely different from everything else so you can't just swap it out. Unless I'm missing something and there's actually a way to install the F100 delay wiring with the 67's oddball switch. I do miss that delayed wiper switch on my old F100. They definitely got it right when they designed that one. Last edited by Magnus; 04-15-2019 at 09:50 PM. Duh, and I own a 67. Yeah, saw that after I posted. You've got me (and I'm sure everyone else) curious now though. Do you know if it's actually possible to put the F100 wiring in a 67? I just don't see how it'd work, and as much as I like the Muscle Car Switch upgrade over the stock switch it's still not as nice as that F100 one is. My understanding is that the F100 intermittent switch will work with Ford 67+ 2 speed motors. IDK why it will not work with 65/66 2 speed motors, but thats what the boys on the net say, so it must be true. 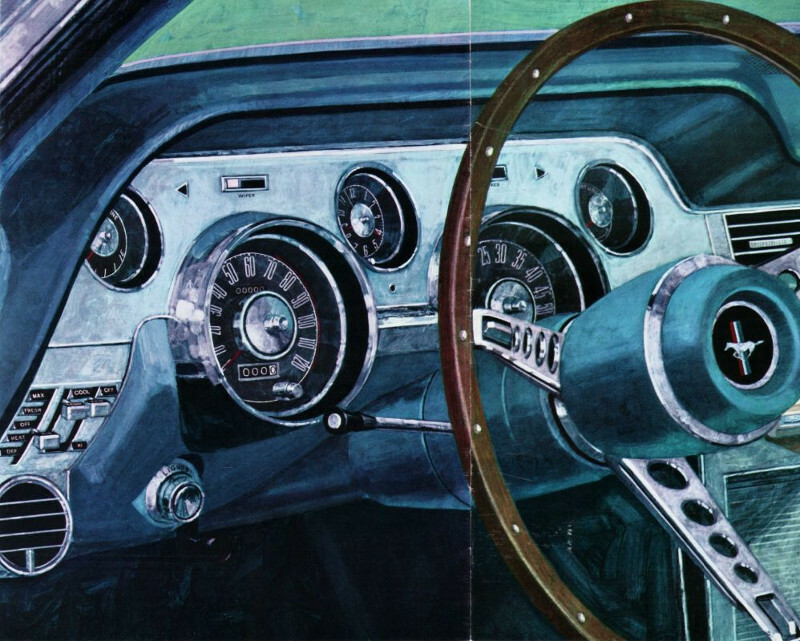 Of course the 67/68 problem is the Mustang does not have a rotary wiper switch.